From time to time, Pudding Club extends and there are six of us rather than four (adults) and so we have a three course meal instead of a two course meal. This time I was on starters as our hosts – brave souls – were making Baked Alaska for pudding. And, for entirely understandable reasons, not practising beforehand. Doubly brave! So for my starters, having plenty of time, I made small amounts of four different canapés. Firstly, Delia’s Bloody Mary Tomatoes – made pretty much as per the recipe. These were interesting, but didn’t really live up to the description on the front page. Perhaps I am just inured to vodka? Secondly, there were some pâté-stuffed dates. That is a pretty simple concept really: a pack of sticky sweet Deglet Nour dates and a little tub of Brussels pâté. Slice open the dates, remove the stone and pack the void with a teaspoon of pâté. If there’s a way of making it pretty, I didn’t find it – they ended up looking pretty odd, but tasting pretty good. The idea came from our recent trip to visit friends in France – they had been very impressed with dried apricots stuffed with foie gras. I don’t like apricots much, and don’t know where you can buy foie gras as an ingredient (and it’s getting harder to find it in restaurants, too) so I improvised. Finally, two types of tartelet. The idea for this – the bases in particular – came from a recipe on the internet that I forgot to bookmark and so I can’t link to it, but I read and remembered the technique and improvised the oven temperatures and other finer details. You use a small tartlet tin – mine has 15 hollows – and you match a round biscuit cutter slightly bigger. Take a standard sliced loaf of bread – actually, thinner slices might be better – and cut off the crusts and roll the slices thin with a rolling pin. Cut out circles of bread. In a pan, melt a big knob of butter with a crushed garlic clove in it and maybe some spices for interest. I used a few cloves. Use a pastry brush to paint the melted butter thickly on both sides of the circles, place into the pan and weigh down with baking beads to bake blind. After a bit of experimentation, try a 180 deg C oven for about 15 mins – although keep an eye on them as they can burn quite quickly. If your canapé filling does not need cooking, keep them in to a deep golden colour; if you are cooking the canapés take them out before they get that far. I made 18 canapés in two varieties, although two testers never actually left my kitchen. I made goats cheese, apple chutney and walnut for half; and pesto mozzarella for the others. All turned out rather well, but the highlight of the evening was definitely the Baked Alaska which turned out sensationally! PS I have written about canapés before when I made up a recipe for individual canapé Beef Wellingtons, which were rather nice. Reading. I don’t do enough of it at home, with too many constant distractions, not least the TV and the internet. Perhaps I should get into a routine which includes a half hour of reading in bed before turning in at a sensible time? Well, the final part of that I have done a little, and I have played a little Tombraider. But as many people have said before me I don’t know how I ever found time to be a councillor when being alone at home all day is so time consuming! And I’ve been really poor at doing any reading at all, and when I have read things, it has been new books, purchased for my Kindle, rather than the far more sensible and parsimonious approach of reading the tonne of titles on Mount Toberead. Anyhoo, here are some pocket reviews. I bought this at the recommendation of David Belbin, Nottingham author of Bone and Cane, and it was brilliant. It opens with the phrase “I were standing on the grass…” and that had me at first slightly puzzled and then hooked. The whole book is written in a semi-dialect that sounded very similar to what people speak in my hometown of Leominster: genders for nouns, interesting conjugations, and a handful of dialect words you have to guess from context. As it opened, my first thought was to hope it didn’t continue in dialect, but as the story unfolded, it gripped me. It seemed authentic enough, and I’m sure I went to school with some of the characters. When I got to the end, I found the author is Worcester-bred, which is a hop skip and jump away. Five stars, awesome, v good. UPDATE: I find there’s a sequel, Booze and Burn. It’s slightly spoilery to say… how is that possible?! Three or four stars for this one – gauche thriller with obvious attempts to manipulate you by bringing in loved ones in peril, and lots of appeals to biological clocks and desperate urge to have babies, that didn’t really speak to me. I was so aware of things being used to try to ramp up the tension, that I didn’t actually feel the tension. As such, I’ve been dipping in and out of this for a couple of weeks. I think I bought it because it was high up the bestseller list and under a quid, or something. Again, high up the bestseller list and very cheap. This has never been published in book form, as far as I can see, but as my blogging friend Wenlock touches on, the Amazon Kindle is allowing a whole new revolution in self publishing. (And indeed, hopefully, Lord Alexander’s Cypher will appear in a future review). For Sale in Palm Springs is securely located within the genre of California PI fiction, and is a worthy entry. Highly readable, with one caveat: Albert Simon is not a native speaker of English. I do not know if that is the reason, but the whole tome could really have done with a good editor. Every paragraph had irritating run-on sentences at least one or twice. The whole book is written in a style that is very similar to spoken word but technically ungrammatical written English. I’m not sure how many readers this would bother, but it certainly bugged me! This is at once good, and annoying. This was the only remotely affordable Karin Slaughter title for Kindle; when it gets down to it, you discover it’s a chilling, nasty (in a good way) short story, and, for padding and advertising purposes, the first two chapters of two other books. The short story is ace. Both of the first chapters seem to be things I’d like to read, if and when I can afford them. The other two are: Broken and Fallen. I’m a huge fan of Mary Roach, who writes witty and humourful books about the parts of science that are often unexplored. She’s amongst the very few non-fic writers I really enjoy – almost all of my leisure reading is crime fiction, so I nearly never touch on any actual fact. I enjoyed Stiff so much it set me off recording a piece for Pod Delusion on donating one’s body for medical science. I still have the forms to donate my own body… perhaps one day I will fill them in. Bonk was awesome, horrifying and embarrassing, and I’m so glad I read it, but not able to lend it to anyone else in case they, you know, want to discuss it out loud. Spook didn’t quite do as much for me as the previous two, because whilst normally Roach is interviewing scientists, half of Spook was about talking to hogwash merchants of the first order. Really, I’m just biding my time till I can afford a copy of Packing for Mars, which sounds really fascinating. No link – as the book no longer appears available. No great shakes as it wasn’t very good. I always worry that most of my cooking when camping is useless – tins, boxes, and things I’d never eat at home, with the odd barbecue for fresh meat. I think campsite cooking will have to form an entirely other blogpost some time. There’s been roadworks on Mansfield Road in Nottingham down in the city centre for a few weeks now – when I walked past on the way to the cinema recently, it appeared they were nearing a crucial phase. 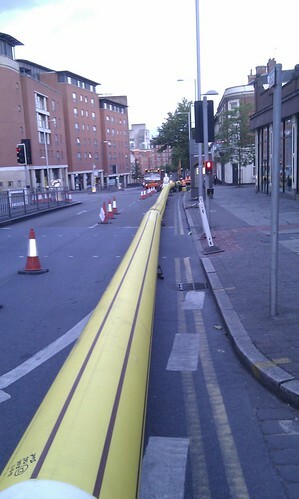 So the end of the small pipe was fed into the opening of the old metal pipe, and the plastic pipe extended tens of metres down the road. 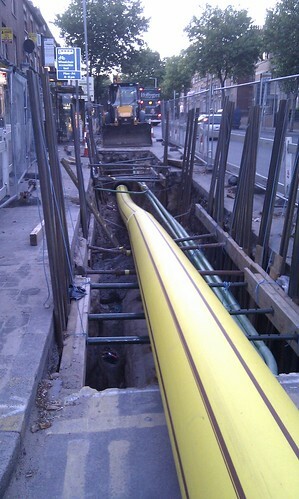 As I walked along the extent of plastic pipe not yet in the ground, I came across the workmen and their kit. They had a small tank-like vehicle with caterpillar tracks and a circle on a stick. It was under the pipe and holding onto it. It looked really clear to me that what was going to happen was that the little tank think was just going to shove the new pipe right into the old pipe. I asked one of the workers if that was the case, and he confirmed.